The following is a sampler of the numerous Temples in the State of Maharashtra. Ajanta Caves at Ajanta near Aurangabad in Maharashtra: A popular tourist attraction, these caves feature magnificient paintings. 5 of the caves are chaityas or temples and 24 are viharas, all in the Budhist idiom. Aurangabad Caves at Aurangabad in Maharashtra: Budhist caves dating back to the 7th century AD with interesting works of sculpture. Ballal Vinayak Temple at Pali near Kolaba in Maharashtra: This is one of the Ashtavinayaks or the 8 sacred shrines dedicated to Ganesh in Maharashtra. Bhaja Caves at Lonavla in Maharashtra: A group of 18 caves said to date from 200 BC with some fine sculptural work. Bhavani Temple at Tuljapur near Sholapur in Maharashtra: This popular shrine in Maharashtra dedicated to the Universal Mother Bhavani is associated Maratha King Shivaji. This is an ancient Shakti Peetham and has inscriptions going back to the 13th century AD. Bhimashankar Shiva Temple at Bhimashankar near Pune in Maharashtra: This is an ancient shrine dedicated to Shiva and is one of the twelve Jyotirlingams or shrines sacred to Shiva in India. This is a small and ancient temple and the current structure is a result of renovations dating back to 1750 AD. Chakreshwar Temple at Titte near Kolhapur in Maharashtra: Located South of Kolhapur, a visit here is considered to be a part of the pilgrimage to the Mahalakshmi temple at Kolhapur. Chinchwad Ganesh Temple at Chinchwad near Pune in Maharashtra: This is a Ganesh shrine that enjoys great popularity in the state and is associated with the 14th century Saint Moravi Gosavi. Elephanta Cave Temples at Elephanta Island near Mumbai in Maharashtra: Four rock cut temples dating back to 450-750 AD with brilliantly sculptured panels with images of Shiva. Ellora Caves at Elllora near Aurangabad in Maharashtra: A popular tourist attraction, these caves, excavated more than a 1000 years feature carvings in the Hindu, Jain and Budhist idiom. Ganapati Tample at Ranjangaon near Pune in Maharashtra: This is one of the better known of the Ashtavinayaks or the 8 shrines special to Ganesh in Maharashtra. The structure dates back to the Marathas and is built in the Yadav style. Ghat Shila Temple at Tuljapur in Maharashtra: A rock said to be sanctified by the presence of Rama from Hindu mythology and the two lingams Rameshwar and Lakshmaneshwar said to be installed by Rama and Lakshman. Girijatmaka Ganesh Temple at Junnar in Maharashtra: This is a rock cut shrine resembling a Budhist Vihar. The image of Ganesh is a rock cut one too. .This is one of the Ashtavinayaks or the 8 sacred shrines dedicated to Ganesh in Maharashtra. 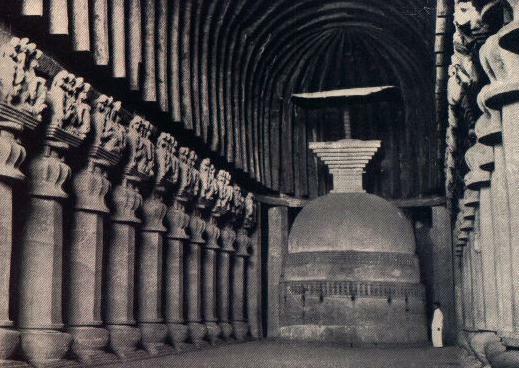 Great Chaitya Cave at Kanheri Caves near Mumbai in Maharashtra: Grandest of the 109 Budhist caves (2nd to 9th century), with a long colonnade of pillars. Jain Temple at Mumbai in Maharashtra: Marble temple dedicated to Adinath decorated with glasswork built in 1904. Kailash Temple at Ellora near Aurangabad in Maharashtra: A marvel of creation, a mammoth rock cut temple dedicated to Shiva, known for its splendid architecutre and sculpture going back to the 9th cent AD at Ellora. Kalaheshwar Temple at Kale near Kolhapur in Maharashtra: 9 miles to the West of Kolhapur a visit here is considered to be a part of the pilgrimage to the Mahalakshmi temple at Kolhapur. Kapaleshwar Temple at Nasik in Maharashtra: Said to be the oldest temple in Nasik. Karla Cave Temple at Karla near Lonavla in Maharashtra: Well preserved Hinayana Budhist temple dating back to 80 BC. Mahalaxmi Temple at Mumbai in Maharashtra: Said to be the oldest temple in Mumbai whose images of worship are said to have been founded in the sea. Mallikarjun Temple at Gotkhind near Kolhapur in Maharashtra: Located east of Kolhapur, and housing a Gupt Lingam (invisible) a visit here is considered to be a part of the pilgrimage to the Mahalakshmi temple at Kolhapur. Panchaleshwar Temple at Pune in Maharashtra: An 8th century rock cut temple similar to the Ellora Temples. Panchganga Temple at Mahabaleshwar near Pune in Maharashtra: Also known as Krishnabai temple it is said to contain five streams including the Krishna river. Pandharpur Vithal Temple at Pandharpur near Pune in Maharashtra: It is one of the most venerated and visited shrines in Maharashtra. The spacious temple is dedicated to Vithal - Krishna-Vishnu and it also houses a shrine to Rukmani. Pandu Lena Budhist Cave Temples at Pandu Lena near Nasik in Maharashtra: 21 Hinayana Budhist caves dating from around the 1st century BC to the 2nd century AD. Parashuram Temple at Pedhe near Chiplun in Maharashtra: A well known temple in the Ratnagiri area dedicated to Parashuram. It is an ancient temple, however the images currently worshipped were installed in the 18th century. Parvati Temple at Pune in Maharashtra: Temple located on a hill top in the outskirts of Pune. Pundalik Temple at Pandharpur in Maharashtra: Said to be the Samadhi of Pundalik who brought Vitthal to Pandharpur. Ramavardayini Temple at Tuljapur in Maharashtra: Enshrines an image of Devi, and this shrine is closely linked with the Indian epic Ramayan. Rameshwar Mahadev Temple at Alate near Kolhapur in Maharashtra: 12 miles North East of Kolhapur visit here is considered to be a part of the pilgrimage to the Mahalakshmi temple at Kolhapur. Ramtek Temples at Ramtek near Nagpur in Maharashtra: This town features many 600 year old temples surmounting the hill of Rama. Sidhivinayak Temple at Sidhatek near Sholapur in Maharashtra: This is one of the Ashtavinayaks or the 8 sacred shrines dedicated to Ganesh in Maharashtra and the current structure is said to have been built by Ahilyabai Holkar. Tryambakeshwar Temple at Tryambakeshwar near Nasik in Maharashtra: Tryambakeshwar is one of the 12 sacred Shiva shrines - Jyotirlingams in India. The temple is an excellent specimen of North Indian architecture and has several ornamental and sculptural features. Vigneshwar Temple at Ozar near Junnar in Maharashtra: This is one of the Ashtavinayaks or the 8 sacred shrines dedicated to Ganesh in Maharashtra. Vishnupaad Temple at Pandharpur in Maharashtra: Shrine on the river where the footprints of Vishnu-Krishna are worshipped and where offerings are made to ancestors.